Five Forgotten Horror Flicks of the Early 80’s that I Saw at the Theater. Halloween season is upon us, and for my very first blog post, I would like to review five horror movies that perhaps you the reader never knew existed. Or maybe you did. Maybe you saw some of these on Son of Svengoolie one early Saturday afternoon as you struggled with a hangover. Or perhaps you know somebody who has one of these movies on a VHS tape; a tape that currently serves its owner best by substituting as a plant-pot holder. These movies aren’t remembered for their state-of-the-art advances in chilling cinema or their critically acclaimed statuses. These movies simply aren’t remembered at all. Perhaps they enjoyed a whole two weeks at the box office. In the blink of an eye, they came and went. The acting in these films is terrible; the writing sub-par. But I remember them. Why? Because these were some of the first horror movies I saw on screen. It was the early 80s, ages 9 –13 for me, and along with an awkward gait and a schizophrenic vocal tone, preadolescence brought me a love for movie screen monsters that scare and slash their victims to pieces. Of course I saw and loved the late 70s and early 80’s horror movie franchises that are still remembered today; Friday the 13th, Nightmare On Elm Street, Halloween, Texas Chainsaw Massacre, and others. But for this post, forget about them. The movies I write about are movies you might have seen 10 minutes of here and there when flipping channels, NEVER realizing that at one time, someone paid to see them at a theater. That someone was me (well, my parents paid), eating popcorn and watching the cheese manifest before my eyes. Only I didn’t think of these films as cheese back them. I thought them equal to gourmet steaks. But of course steaks didn’t impress me too much back then. Pizza did. And on the pizza is cheese! This was the first horror movie I ever saw in the theater. My dad took me, as we both shared a love for carnival “spook” houses as he called them. Both of us were surprised that main characters were getting themselves killed! I guess neither of us was yet familiar with Halloween and Friday the 13th movies that helped spawn the axing, knifing, splicing and dicing away of annoying teenagers. This is my favorite of these five films and will receive the longest review. 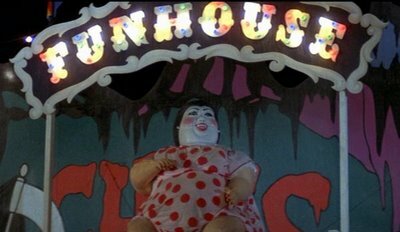 Released in 1981, the plot of The Funhouse is simple: four teenagers (two couples) spend the night in a funhouse, where they accidentally witness the son of the funhouse’s barker kill a woman. The owner and son discover the teens, realize they are witnesses to the murder, and set off to kill them, one by one. Okay, there’s a little more to it than that. The movie begins with Amy Harper being warned by her parents not to go to the carnival that has come to town. Newspapers claim that people have gone missing in other towns where the carnival tramped through, and, you know, beware and all the stuff. Amy and her friends go anyway to what is perhaps the best carnival ever! I say that because I have been to many carnivals, and never have I seen any that match the attractions this movie carnival has. Every carnival thrill ride ever imagined seems to be here, along with a freak show, a magician’s tent, a fortuneteller, and a state of the art funhouse that a mechanical engineer would fawn over. Now if these four teens were able to read between the lines, they would see how foreboding these attractions are. The attractions hint at doom and gloom. But only the audience understands. The magician stabs a woman encased in a coffin right in the heart. Blood pours out of her mouth. But she is okay! It was just a trick. But this just goes to show how gory these carnies can be. In the freak tent, they see the small, preserved body of a deceased infant in a jar. It was born with enough deformities to give it the appearance of some kind of creature that only Hell could spawn. They all seemed spooked at the sight of this and experience some sort of collective déjà vu. The fortuneteller starts to give them dire news, but the kids laugh it off. Finally, they decide that it would be cool and really far out if they spend the night in the funhouse. They would just jump off the gondola car when it takes them deep inside the funhouse. And that’s what they do. In between heavy kissing, pot smoking and whatever, they hear noises coming from the floor below. Looking down between floorboards, they see into a room where the fortuneteller lady is granting sexual favors to the son of the funhouse barker (for money of course). The adult son, who speech is limited to grunts and howls, chooses to keep his face hidden in a Frankenstein mask. Right away, the spying kids and the viewing audience can tell that there is something not quite right with this guy in the mask. okay to kill ‘marks’, so long as you don’t get caught. And his son has killed many, so we learn). Daddy yells away at his son, son removes the Frankenstein mask and…OMG….he looks more horrifying than any Frankenstein monster. Then we learn that that his brother was the baby in the bottle at the freak show tent. It seems this carnival barker has misfortunate loins that result in grossly deformed children. Well, one of the teens drops a lighter down though the gaps in the floorboards and Carnie and son now know they are being watched. Now the kids must escape the funhouse. As they trek through the darkness, ghoulish attractions go on and off, eerie music attacks their ears and, oh yeah, the deformed, mute son appears here and there and steals away the kids one my one. To kill them. The acting on the part of the actors who played the teenagers is painful to watch. The overall carnival and funhouse environment is exciting to watch! Dean Koonz, then a struggling author, was asked to write a book based on the screenplay of this film. Since he had not yet achieved commercial success, he jumped at the chance to attach his name to a book that would be made into a movie. (Well, he penned this book under the name Owen West). Since the screenplay gave him very little to work with, he created a lengthy back-story. In fact, the events at the carnival (which was the entire movie) only take up a third of the book if that. I have just finished the book and it is quite good, better than the movie. But a review of the book is for a different time as this blog piece is about movies. All in all, this is a fun movie, cheesy and campy at times, locked within that realm of forgettable horror movies of the early 1980s, but…ahhhhh! Just watch it! “After Midnight, we’re gonna let it all hang out!” I bet Eric Clapton wasn’t talking about the innards of young women when he wrote this song. Okay, maybe this movie isn’t either. But it is about the ritualistic killing of young women at midnight, and the cult that does the killing doesn’t do so in a way that rocks the women into a peaceful, eternally slumbering sleep. My mom took me to see this movie when it came out in 1982. I guess that means I was eleven years old. I think I was on a play date with my mom’s friend’s little niece who was about nine. Jeepers! So young we were! Why didn’t mommy take us to an arcade, or bowling, or whatever? Ah who cares. I still remember this movie. Thanks for the memories, mom! Made my John Russo, co-writer of The Night of the Living Dead, the movie opens with a young girl caught in some kind of animal trap way out in rural hell someplace. The trap was set by your average, friendly family of red-necked cultists. A mother (I guess the leader of the cult) and her three boys and one daughter look over the prize in the trap. The girl is crying and begging and one of the boys insists that the girl in the trap is “so in so” from town. He is quickly corrected by his mother, who tells him that the girl is actually a demon meant to fool him into thinking it’s that girl he knows. Makes sense, so one of the boys kills her on the spot while another boy laughs manically. Later, in a ritual dedicated to the master of all horrors (Satan), the young girl stabs the corpse. Years go by, and this family of cultists still exists, only now the mother is dead and the children are grown. I don’t know where the father ever was, but hey, this movie proves that a family needs a positive male role model or else, well, you know, the family might run amok and turn into psychotic killers or something. Though the mother is dead, her children have her corpse up in the attic sitting in a chair. Total Hitchcock Psycho style! They talk to her, ask her advice, that sort of thing. True to the malevolent spirit of their mother, the adult kids continue on with killing. Easter weekend is approaching, and they need three women to kill, one for each night of the three day Easter celebration. So they hunt here and there. 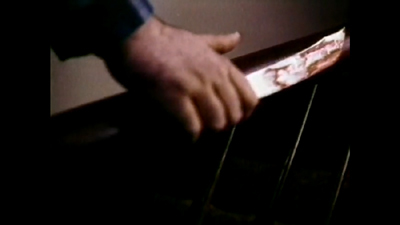 In the beginning of the movie when we first come across one of the killers, only the flannel shirt and jeaned-leggings of an overall wearing cultist is seen as he pulls women out of their homes and away from their campfires. But his laugh is heard; a creepy kind of “hee hee hee hee” thing is going on as he carries away screaming women. Later, he is revealed to be just a regular overweight, bearded mute redneck. Clarification, he’s a regular overweight, bearded mute redneck who kidnaps and kills women. The daughter runs the show now, as did her mother before her. They have captured a poor, runaway girl, who serves as this film’s main character. She had run away from her drunken, sexually abusive stepfather. But despite his past digressions, he will seek to redeem himself as the hero of the film as he tracks down these cultists and seeks to rescue his daughter. The same kind of stuff plagues this movie that haunts most of these 1980 horror films. Bad acting, bad dialogue (oh is it bad in some places! ), and awkwardly placed hokey-happy music, such as a song that sounds like a rejected Partridge Family tune that plays when the “heroes” of the film are shoplifting. I don’t know, I guess it was supposed to be a lovely, touching moment, watching them steal from a grocery store. Silly, low-budget stuff, and yet, this film’s amateur style adds to its overall bizarreness in an interesting way. So what the hell, watch the movie! A movie about a guy dressed in a Santa’s suit, running amok and killing people. I had a teacher who did not like this concept at all. He warned his class that such a movie was in existence. He told us that if we were planning to go see this movie then we are sickies. He further said that if you have parents that were taking you, that he was sorry, but our parents are sickies too! Hi there, I am a sickie (and so was my mom I guess), and I will give a brief synopsis of the plot. A young boy witnesses his parents being killed by a man dressed in a Santa suit. Parentless, he lived out the rest of his young years in a Catholic run orphanage. Every Christmas season, the young boy draws disturbing pictures of Santa Claus, macabre style. Nuns confiscate his drawings and the age-old debate begins as to whether the disturbed boy needs more harsh discipline or caring, professional help. Discipline wins. Years later, the nuns get the “little boy” his first job as a boxboy/stockboy at a grocery store. Of course he is no longer boy, but a handsome, big and strong man. The store manager asks him to play Santa Claus at Christmas time. Oh no! Talk about identity crisis, talk about cognitive dissonance! If he dresses like Santa, and has to be like Santa, that dark persona buried deep within him (that was never properly extinguished, shame on you nuns!) tells him that he must kill like Santa. So he does! The rest of the movie, he runs around killing people. I guess my teacher was right. There is not much cinematic value in this film. In fact there’s none. Oh but what the heck, watch it anyway. ** ***After writing this, I spoke to several people who had indeed heard of this movie. 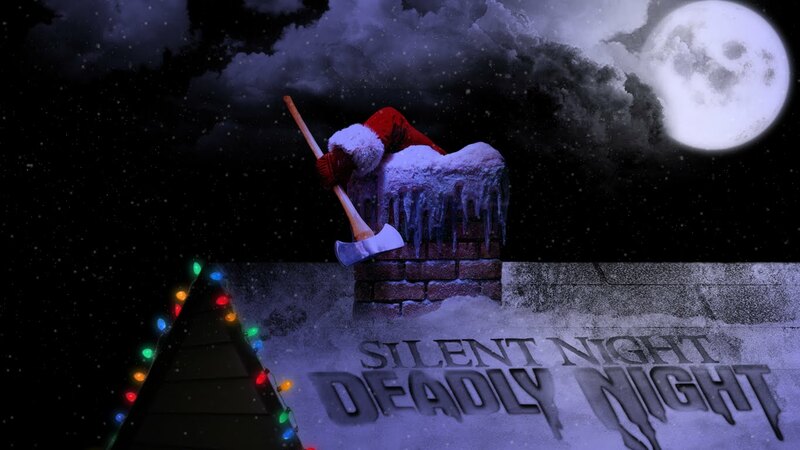 I then learned that there was a franchise of this crap; Silent Night, Deadly Night 2, 3, 4…..8375..8376…and so on. Just watch the first one. Have mercy on yourself. 1) His wife’s father, Russian psychic Karl Raymar, died of a heart attack while killing six young women by robbing them of life sustaining electromagnetic energy so to that he might absorb it into himself and use it to move objects with him mind. .
2) Olivia McKenna, his wife, has inherited some of the psychic powers of her father. 3) Though dead and buried within a vault in a mausoleum, the psychic power of Raymar lives on, and he’s about to use his telekinetic abilities to play around with the other corpses buried around him and make them prey upon several teenagers who are trespassing inside these crypts. The plot has little to do with the Adam West character. His character is forgettable, but I tossed him into this synopsis because, well, isn’t it funny to have the TV Batman starring in a early 1980s horror flick? Karl Raymar is a psychic vampire. He drains people of their life force. Now he’s dead and he’s just as mischievous as ever. His body is buried within a “mega-mausoleum.” There are many aisles of tombs shelved into the walls. Now here comes the “teen-scream” part. Julie Wells is highschool girls searching for popularity and acceptence. She seeks to join the social club called “The Sisters”, which consists of three snooty girls who get to wear cool, shiny lavender jackets that are inscribed with the words… you guessed it; “The Sisters”. Julie is dating the ex of the alpha-female of The Sisters, and oooo, this is not good. Not good at all. We can see where this is going. It’s not easy to become a “Sister.” There is a tough initiation, and Julie is about to enter the final phase: she must spend the night in a mausoleum. Alpha female Carole hates Julie and will do anything to make her initiation experience as hellish as can be. She and her friend trick Julie into taking hallucinogenic drugs. Unbeknownst to Julie, they too are in the mausoleum so that they might spy on her, scare her. Oh but these naughty naughty girls are going to get a scare of their own. Raymar busts out of his tomb. Strange, silly-looking electrical charges emit from his eyes. Bodies burst out of the walls that hold them in. They surround the bad girls; fall on them, creating a scene that looks like a football tackle pile. Through premonitions, Olivia McKenna sees what’s going on inside the mausoleum. She rushes out of her home in the middle of the night to go there. Can she get there before daddy dearest causes too much damage? Some classify this as a zombie film. But what’s interesting to note is that dead are not like “The Walking Dead”. Rather, they are the “moving dead”. They don’t move on their own accord. They are not looking to eat brains as zombies do in some movies. 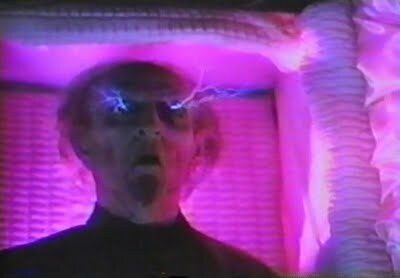 The moving dead in this film are just objects controlled by deceased yet still highly talented Russian psychic dude. Is this a good movie? I liked it as a kid. Did I like it when I re-watched it? Maybe. I don’t know. Quit asking questions and go and watch it! Exit Adam West, enter Demi Moore. Yeah, THAT Demi Moore. She’s a main character in this movie that came and went faster than the parasites that jump out at the audience in thrilling 3D! According to IMDB.com, this was her second movie. Way back when I was a kid, too see a movie in 3D, one had to wear these flimsy paper glasses, where one lens was red and the other was blue. Also way way back when I was young, things in 3D movies jumped out at ya! That was the whole point of seeing 3D. Whether it was the long rifle that stopped just before the rim of your glasses in Coming At Ya, or the eyeball that almost landed in your popcorn in Friday the 13th part 3, or like with this movie, a snaking slimy parasitic creature that is about to bite you in the nose, things in 3D movies were meant to jump of the scream and stop your heart in the process. Okay, that happens a little bit in today’s ever-increasing catalog of three-dimensional movies. But not like them there old’n days of the early eighties. So yeah, I remember this movie being scary because when I saw it in the movie theater, things jumped out at me. And oh yeah, there was this “plot” that came with these 3D effects. Parasite is one of those post-apocalyptic movies. Atomic wars occurred sometime in the recent past, fresh food is scarce, money is worthless and yeah…bad times, bad times. Oh, there are these “Merchant” folks that work to corrupt the government. They brand the skin of people and put them in work camps, which were formerly known as “suburbs”. We don’t see any of this, we just hear about it in the dialogue. We do see one Merchant. He dresses in a fine suit, has a cool black car with power doors. His gun discharges from a mechanical apparatus in his sleeve and it shoots lasers. James Bond anyone? Oh but he’s no hero. He’s the bad guy, searching for the hero; the most lifeless, uninteresting hero in the history of cinema. Maybe it was the poor acting. Yeah, that’s it. Anyway, hero guy is a scientist of sorts and he has developed deadly, blob-like parasites. Through some accident, one is trapped within his body. He keeps the other (there are only two) in a thermos-like container. Using music, and when the two parasites are near each other (one being inside the host, one being right outside the host), the invading creature will leave the host and crawl out to be with his buddy. Oh I don’t know why, this is just how it works. He has the means to do all this, but he doesn’t. Instead, he lounges around, eating canned soup at this diner, and wouldn’t you know it, a local hang of hoodlums rob him and steal the thermos with the second parasite creature. NOW…we have a plot that gives us an escaped parasitic creature that attacks its human prey while every once in a while, charges at the folks in the theater. See how it all works? Oh this movie is pretty lame. But I loved it back in 1982.